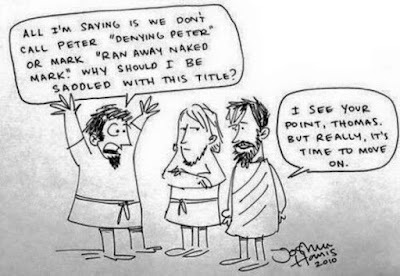 "Doubting" Thomas is the Gospel for tomorrow. It always seems a bit unjust to me that Thomas alone is singled out for lack of faith by this nickname --and by a billion scolding homilies whenever his story is read at Mass. 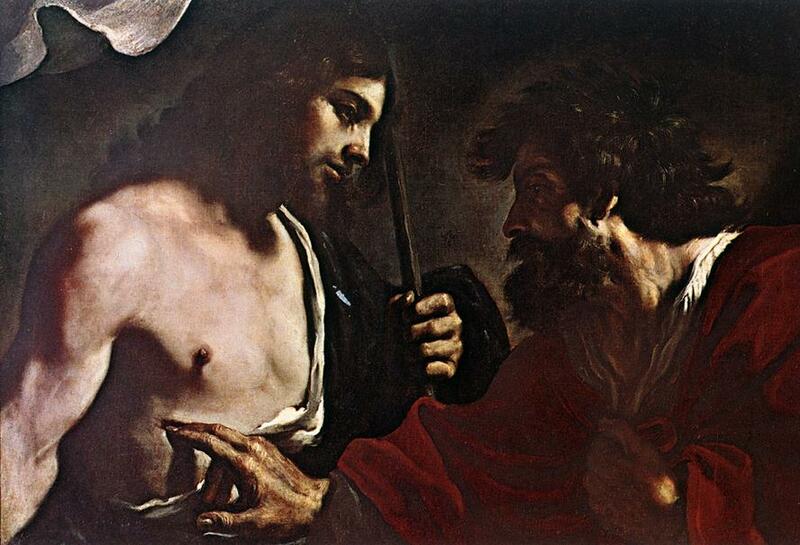 Yet Thomas' doubt was not more than that of the the other apostles upon first hearing of the Resurrection. None of the others believed on the strength of witness alone either. It's not as if anyone one said, in response to Mary Magdalene's witness, "Alleluia!" Thomas just had the misfortune of not being present when He first appeared to the others. He should be called Tardy Thomas instead. Paintings always show him, as here, with his fingers in the Lord's side, which is likewise not quite right. It's true he told his fellow apostles that he wouldn't believe unless he put his fingers in Christ's side, but that was just big talk. When Christ actually appeared to him, proffering his wounds, Thomas didn't touch, but immediately cried out with simultaneous recognition, humility, and wonder: "My Lord and my God!" (Which is likewise what we are doing when the host is elevated at Mass and we, recognizing Christ in the Eucharist, cry silently, "My Lord and my God!") So he could also be called Eucharistic Thomas.